Welcome to the UC IT Blog! If you’re in IT at UC, you’ve come to the right place. 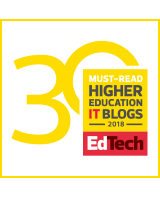 This blog was launched by Systemwide CIO and Vice President of Information Technology Services Tom Andriola as an opportunity to build an IT community and share stories. Join our community of over 1,800 blog subscribers, 1,020 LinkedIn users on the UC IT Professionals Network, and 4,400 colleagues on the UC Tech Slack channel. Reach out to Yvonne Tevis with any ideas for articles, colleagues to interview, or ways to improve the blog. New website looks good. The site has a clean look and is well organized. It is easy to focus on the content and navigate though the site.